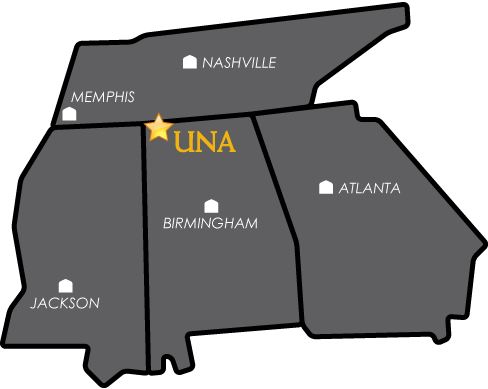 For all awards, please send an email with your application form, résumé, and supporting documents to engscholarships@una.edu. Students need to send a separate email for each award they apply to. The subject line of the email should include your name and the name of the award to which you are applying. File names should include your name and file type, i.e., letter/essay, résumé, or transcripts. Example: johndoe_resume.doc. Please note that not all endowed scholarships are awarded each year and that dollar amounts of endowed scholarships vary, depending on availability of funds. As a rule, endowed scholarships are not automatically renewed. Open to full-time students majoring in English. This scholarship is available for one academic year; prior recipients may reapply. Selected by the Department of English. A separate application is required. The deadline to apply is the first Monday of February of each year. Application Form (Click to open form. If you have Adobe Acrobat you will be able to fill out and save the form. Otherwise, you will have to print out the form, fill it out, and create a new pdf by scanning it). English Majors who have achieved a minimum 3.0 GPA. Preference will be given to students majoring in English Education. This scholarship is for one academic year, but prior recipients may reapply. A separate application is required. Contact the Department of English or Student Financial Services for more information. Awarded to deserving students with a minimum 3.0 GPA. Preference given to students majoring in English or Professional Writing. This scholarship is for one academic year only; prior recipients may reapply. A separate application is required. The deadline to apply is the first Monday of February of each year. Awarded to undergraduate or graduate English majors (English Options I or II or Language Arts Option III) with a minimum 3.0 cumulative undergraduate average or 3.5 cumulative graduate average and who demonstrate evidence of financial need. Preference to members of Sigma Tau Delta, former students of Pinhook School, and residents of Lutts, Tennessee. This scholarship is for one academic year only; prior recipients may reapply. Selected by the Department of English. A separate application is required. The deadline to apply is the first Monday of February of each year. Special preference shall be given to English and Professional Writing majors, followed by Language Arts majors. This scholarship is for one academic year only; prior recipients may reapply. Selected by the Department of English. A separate application is required. The deadline to apply is the first Monday of February of each year. Awarded to full-time students majoring in Language Arts with an expressed intention of becoming English teachers. Students must have achieved a minimum 3.0 grade point average overall and a 3.25 in the major and be full time students advancing toward their first undergraduate degree. This scholarship is for one academic year only; prior recipients may reapply. Selected by the Department of English. A separate application is required. The deadline to apply is the first Monday of February of each year. All undergraduate English majors (Options I and II) working toward a first degree and also majoring/minoring in History. Applicants must have achieved a minimum 3.0 grade point average overall and a minimum 3.25 grade point average in the major. This scholarship is for one academic year only; prior recipients may reapply. Selected by the Department of English. A separate application is required. The deadline to apply is the first Monday of February of each year. Open to all full-time students majoring in English (Options I, II, or III) who are graduates of Florence High School and who have a minimum 3.0 grade point average overall and a minimum 3.25 in the major. This scholarship is for one academic year only; prior recipients may reapply. Selected by the Department of English. A separate application is required. The deadline to apply is the first Monday of February of each year. Open to all students but preference will be given to upperclassmen majoring in English. Recipients of the scholarship must have demonstrated financial need based on the current and future need based guideline of the University. Applicants must have achieved and maintain a minimum 3.0 grade point average. A separate application is required. The deadline to apply is the first Monday of February of each year. Please read the application directions carefully. Students need to send a separate email for each award they apply to. The subject line of the email should include your name and the name of the award to which you are applying. File names should include your name and file type, i.e., letter/essay, résumé, or transcripts. Example: johndoe_resume.doc. Please note that not all endowed scholarships are awarded each year and that dollar amounts of endowed scholarships vary, depending on availability of funds. As a rule, endowed scholarships are not automatically renewed. Open to all full-time graduate students pursuing a Master's Degree in English who have achieved a minimum 3.25 grade point average overall and are advancing toward their M.A. degree in English, meeting all standards in good standing in the program. Each assistantship is for one academic year only; prior-year recipients may apply. A separate application is required each year. The deadline to apply for the academic year beginning in the fall is the first Monday of February. Application Form (Click to open form. If you have Adobe Acrobat you will be able to fill out and save the form. Otherwise, you will have to print out the form, fill it out, and create a new pdf by scanning it). Please send application materials to the Director of Graduate Studies, Dr. Kelly Latchaw. Recipients shall be full-time students pursuing a Master’s Degree in English and resuming their educations after an absence of at least five years. Preference is given to women (to the degree permitted by law). Selected by the Department of English. A separate application is required. The deadline to apply is the first Monday of February of each year. Application Form (Click to open form. If you have Adobe Acrobat you will be able to fill out and save the form. Otherwise, you will have to print out the form, fill it out, and create a new pdf by scanning it). This application form needs to be sent to engscholarships@una.edu. For current Master's degree students who are focusing on Renaissance literature. Applicants must have a 3.0 undergraduate g.p.a. and be a full-time students. Awardees must maintain a 3.5 graduate g.p.a, write a thesis which in some way addresses the works of Shakespeare, maintain full-time status, and take EN623 and either EN621 or EN622. Application information form. All materials are directly sent to the Director of Graduate Studies, Dr. Kelly Latchaw. For current undergraduate and graduate students who have been accepted into the London Study Abroad program. Applicants must have a research project focused on Shakespeare, with a component that can only be carried out while in London. Application information form. All materials are directly sent to Dr. Cheryl Price at cprice7@una.edu by the extended deadline date of 1/20/2019.